A 6-year-old girl, a known case of Kawasaki disease, presented with acute thrombotic occlusion of right coronary artery (RCA) with symptoms of acute angina and myocardial dysfunction. She underwent beating heart off-pump coronary artery bypass graft (CABG) surgery with right internal mammary artery (RIMA) grafted to distal RCA. Follow-up computed tomography angiogram revealed well-flowing RIMA with no obstruction or kink. This case highlights the importance of CABG as a safe and life-saving procedure in expert hands, even for children in emergent conditions. A 6-year-old girl child was admitted with complaints of severe pain over the shoulder and jaw, associated with excessive sweating and dyspnea, 12 hours preceding admission. She was diagnosed with KD 6 months previously and had received two doses of intravenous immunoglobulin at that time and was on aspirin and clopidogrel, with history of reactivation of KD along with Reye like illness 3 months after the initial episode. At admission, electrocardiogram showed ischemic changes in lead II, III and avF. Echocardiography revealed regional wall motion abnormality with left ventricular dysfunction. Laboratory investigations showed increased levels of serum myocardial enzymes. 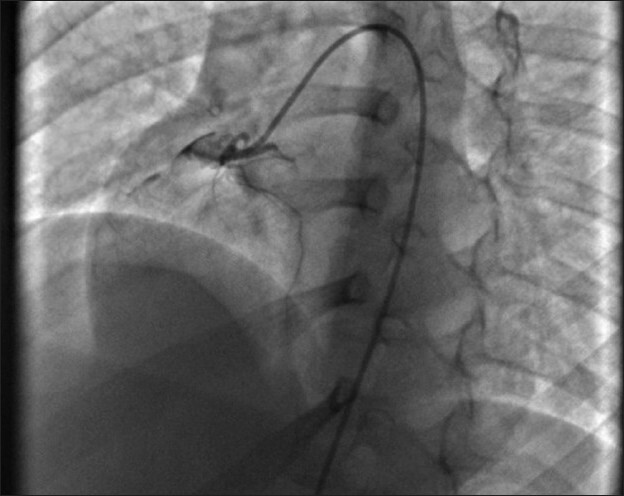 Coronary angiography revealed total thrombotic occlusion of an aneurysmally dilated proximal RCA [Figure 1] with retrograde filling of posterior descending artery from a normal left coronary artery and a good sized RIMA. Operative findings included a 15-mm thrombotic RCA aneurysm extending up to the mid-RCA [Figure 2]. 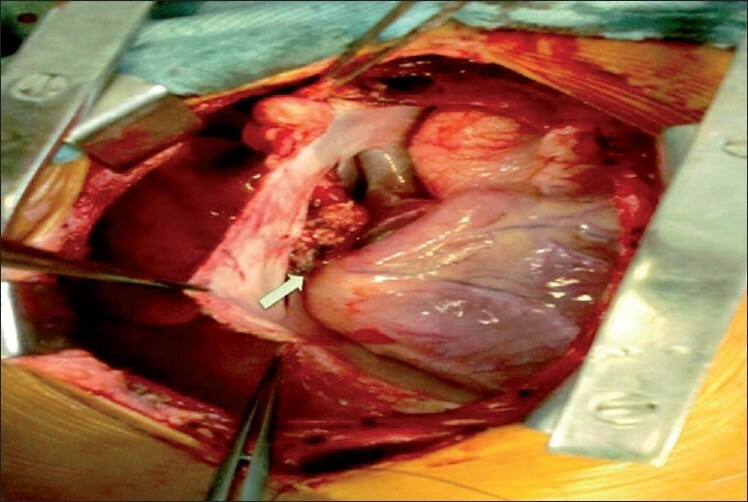 She underwent off-pump beating heart revascularization procedure with RIMA grafted to distal RCA [Figure 3] with interposition saphenous graft, as RIMA was short for the anastomosis. Since KD is a medium-sized vessel vasculitis, a saphenous interposition venous graft was used. Also, harvesting a radial graft is risky with more chances of complications in children. The postoperative stay was uneventful and the child was discharged 7 days after CABG with fully recovered ventricular function. 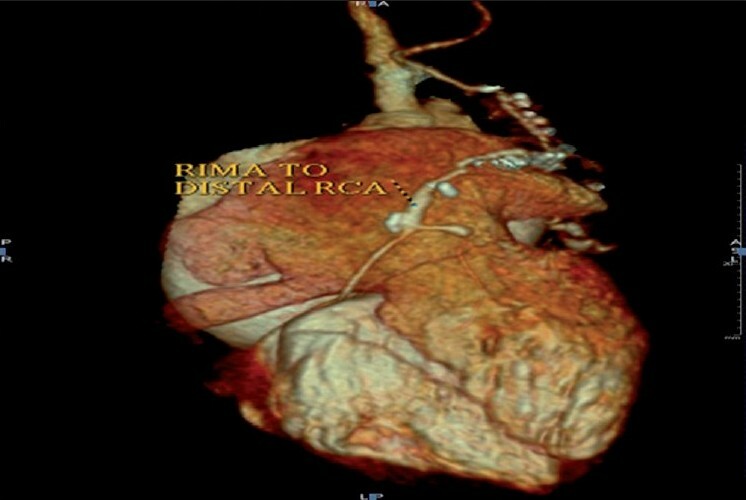 Follow-up CT angiogram, 2 weeks after the discharge, revealed a well-flowing RIMA with distal RCA anastomosis with no evidence of any obstruction or kink [Figure 4]. Surgical revascularization for coronary artery disease secondary to KD is relatively uncommon. Aneurysms tends to develop most frequently in the left main coronary artery (LMCA) followed by left anterior descending artery (LAD) and RCA. The left circumflex artery (LCC) is least often involved. Significantly higher temperature on days 9-12 and longer duration of fever (>14 days) appear to be the risk factors for developing coronary aneurysms. Generalized microvasculitis occurs throughout the body in the first 10 days of the disease. Myocardium is affected mainly in the first 3-4 weeks, with valvulitis involving mitral and aortic valves. Inflammation persists in the coronary arteries, characterized by edema, mononuclear cell infiltration and progressive fibrosis with internal elastic lamina destruction and aneurysm formation. Coronary bypass operation is a safe and reliable surgical modality for coronary artery sequelae in children with KD and it should be considered as a possible treatment modality for coronary revascularization even in young children. This procedure remains a technical challenge and requires careful follow up. 1. Takahashi M, Mason W, Lewis A. Regression of coronary artery aneurysms in patients with Kawasaki Syndrome. Circulation 1987;75:387-94. 2. Singh S, Kumar L, Trehan A, Marwah RK. Kawasaki disease at Chandigarh. In Pediatr 1997;34:8225. 3. Singh S, Kumar L. Kawasaki disease - treatment with intravenous immunoglobulin during acute stage. In Pediatr 1996;33:689-92. 4. Tatara K, Kasakawa S. Long term prognosis of giant coronary aneurysm in Kawasaki disease. an angiographic study. J Pediatr 1987;111:705-10. 5. Naoe S, Shibuya K, Takahashi K. Pathological observations concerning the cardiovascular lesions in Kawasaki disease. Cardiolo Young 1991;1:212-20. 6. Kato H, Ichinose E, Yoshioka F, Takechi T, Matsunaga S, Suzuki K, et al. Fate of coronary aneurysms in Kawasaki disease: serial coronary angiographic and long term followup study. Am J Cardiol 1982;49:1758-66. 7. Nakano H, Ueda K, Saito A, Nojima K. Repeated quantitative angiograms in coronary artery aneurysms in Kawasaki disease. Am J Cardiol 1985;56:846-51. 8. Takahashi k, Naoe S, Oharaseki T. Autopsy cases of Kawasaki disease with ruptured coronary artery aneurysm (abstract). Pediatr Res 2000;47:558. 9. Kitamura S. Surgical management for cardiovascular lesions in Kawasaki disease. Cardiol young 1991;1:249-53. 10. Legendre A, Chantepie A, Belli E, Vouhι PR, Neville P, Dulac Y, et al. 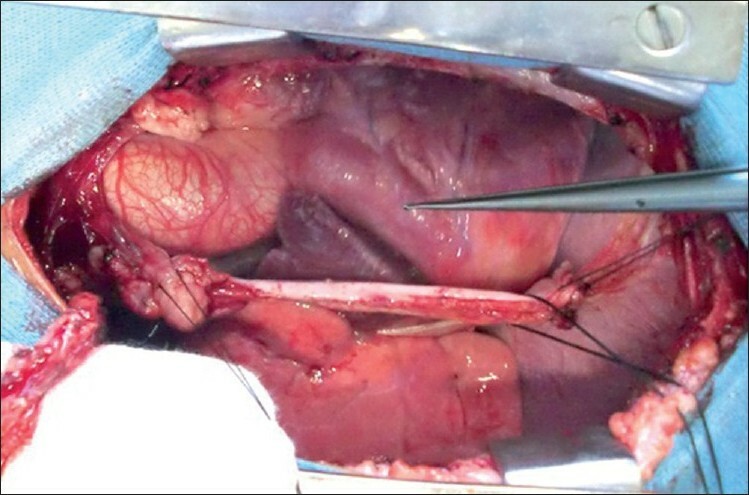 Outcome of coronary artery bypass grafting performed in young children. J Thorac Cardiovasc Surg 2010;139:349-53. 11. Shah PJ, Bui K, Blackmore S, Gordon I, Hare DL, Fuller J, et al. Has the in situ right internal thoracic artery been overlooked? An angiographic study of the radial artery, internal thoracic arteries and saphenous vein graft patencies in symptomatic patients. Eur J Cardiothorac Surg 2005;28:510-1. 12. Chanthong P, Sriyoschati S, Durongpisitkul K, Soongswang J, Laohaprasitiporn D, Nana A. Coronary artery bypass graft in Kawasaki disease patients: Siriraj experience J Med Assoc Thai 2005;88:197-202. 13. Nabuchi A, Sonobe T. Minimally Invasive Coronary Artery Bypass Grafting Surgery in a Child With Kawasaki Disease. JJTCVS 2001;49:82-4. 14. Rastan AJ, Walther T, Falk V, Gummert JF, Eckenstein JI, Mohr FW. Off-pump coronary artery bypass grafting. State of the art 2006 and results in comparison with conventional coronary artery bypass strategies. Herz 2006;31:384-95. 15. Sellke FW, DiMaio JM, Caplan LR, Ferguson TB, Gardner TJ, Hiratzka LF, et al. Comparing on-pump and off-pump coronary artery bypass grafting: numerous studies but few conclusions: a scientific statement from the American Heart Association council on cardiovascular surgery and anesthesia in collaboration with the interdisciplinary working group on quality of care and outcomes research. Circulation 2005;111:2858-64.